What Was the Importance of Ziggurats in Ancient Mesopotamia? The people of ancient Mesopotamia practiced a religion that modern scholars are only just now beginning to understand and the physical focal point of their religion were the monumental, triangular structures known as ziggurats. Today, many people like to compare ziggurats – which is derived from the ancient Akkadian word for the structures, ziggurratu – with their counterparts the pyramids in Egypt. Although both pyramids and ziggurats were constructed during the same time period, they served different functions and were built using different methods and from different materials. Ziggurats were also built over a much longer period than Egyptian pyramids and most importantly, ziggurats were built by a plethora of different people who inhabited ancient Mesopotamia. Mesopotamia, unlike Egypt, was full of disparate and at times warring ethnic groups, but they all followed a similar religion and built ziggurats to appease their gods and as signs of temporal power. The fact that ziggurat construction took place over such a long period – from the third millennium until the sixth century BC and was done by so many different groups of people is an indicator of the importance of these colossal structures. An examination of the various dynasties that came to rule Mesopotamia shows that ziggurats were important for a number of reasons: they served as a way for the people to connect to their most important gods, they provided a focal point for the secular community, and they also acted as a visible and tangible sign of a king’s power. Any king worth his salt in ancient Mesopotamia had to build a ziggurat that could be seen for miles around, which would ultimately serve to immortalize him for posterity. Later, true ziggurats would dwarf these early ones in size, but the meaning, style, and construction methods used to make them were established during this early period by the Sumerians. It was also during this early period when the secular, along with the religious importance of ziggurats was first solidified. Modern archaeological excavations in Mesopotamia have determined that ziggurats were often the first buildings constructed in a settlement and that they in fact provided much of the impetus for early urban development in Mesopotamia. As Mesopotamian cities grew in size, ziggurats were also at the center of the growth. Mesopotamians took the knowledge they learned at ziggurat temple complexes to create bigger and more intricate ziggurats. Although ziggurats were truly impressive monuments to behold, they have for the most part not stood the test of time. Unlike the pyramids, which were made of stone, ziggurats were made primarily of mud brick and clay with some stone. Unfortunately, despite being constructed with sound methods and mathematical precision, the core material of clay and mud brick led to the demise of nearly every ziggurat in Mesopotamia. Today, only the ziggurats that have been preserved by modern antiquities services have survived and oftentimes only the parts made of stone. 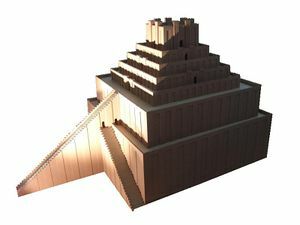 With that said, the ephemeral nature of ziggurat building material was not enough to stop numerous kings from several dynasties from constructing ziggurats and improving on the techniques of their predecessors. As noted above, the earliest ziggurats were built by the Sumerians in the southern region of Mesopotamia in the third millennium BC. 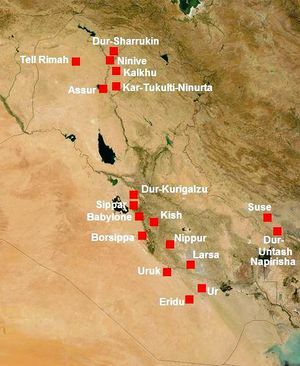 At that time, Mesopotamia was essentially divided into several independent and often competing city-states until the Third Dynasty of Ur – named for the home city of the dynasty – was established by Ur-Nammu (ruled ca. 2112-2095 BC). Ur-Nammu unified the region through force, but then set about to legitimize his rule, and that of his dynasty, through a variety of measures, one of which was the construction of the Ziggurat of Ur. The ziggurat was dedicated to the moon-god and stood at the center of a massive temple complex that dominated the city of Ur. The size of the Ziggurat of Ur was so much more massive than any of its predecessors – its base measures 190 by 130 feet and although only two levels remain today, scholars believe that there was once a third level. When the Third Dynasty of Ur collapsed, the Sumerians disappeared as a people by assimilating with their other Mesopotamian neighbors, but the importance of ziggurat building continued with other ethnic groups that came to rule Mesopotamia. After the decline of the Sumerians, the cultural focus of Mesopotamia shifted northward to the region around the city of Babylon, which was known as Babylonia. It was in and around Babylon where kings of the Amorite and Kassite ethnic groups built their ziggurats to honor their gods and to express their political legitimacy to the people. 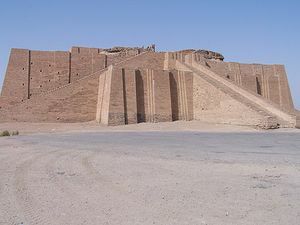 One of the more impressive ziggurats was built by a Kassite king named Kurigalzu I (reigned sometime in the early fourteenth century BC) in a newly founded city. The name of the city was Dur-Kurigalzu (“Kurigalzuville”), which was located in the northern area of Babylonia. The ziggurat formed the center piece in a large palace and temple complex, much like its predecessors in southern Mesopotamia. The construction of the city of Dur-Kurigalzu on virgin soil and the accompanying ziggurat were meant to appease the Babylonian god Marduk, no doubt, but also to legitimize the reign of the enigmatic and poorly documented Kurigalzu I. As time went on in ancient Mesopotamia, the political importance of ziggurats continued to increase – kings continued to build bigger and more impressive ziggurats as testaments to their greatness. The first millennium BC saw the political and cultural energy of Mesopotamia migrate once more to the north, this time to the region of Assyria on and around the Tigris River. When the Assyrians were not busy conquering the rest of the Near East, they were building new cities such as Nineveh, Assur, and Nimrud. Most of the major Assyrian cities had ziggurats, which were dedicated to their primary deities – Assur and Ishtar – but also served as a visible reminder of Assyrian supremacy in the region. 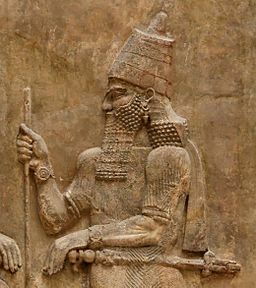 Assurnasirpal II (ruled 853-859 BC) chose to build his ziggurat in the city of Nimrud, but unfortunately, like with most ziggurats and all Assyrian ziggurats, nothing remains. The fourth century BC Greek general and historian, Xenophon, wrote what was probably the last account of the Ziggurat of Nimrud when he and his contingent of Greek mercenaries passed by it in 399 BC. Xenophon noted: “Near the city there was a pyramid of stone, a hundred feet broad, and two hundred feet high.”  It is worth pointing out that Xenophon only viewed the remains of the ziggurat, which means that it was probably much taller when it was operational. Although nothing remains of the Etemenanki Ziggurat, its greatness inspired awe in people from far outside Mesopotamia. The fifth century BC Greek historian, Herodotus, wrote of it stating, “on the summit of the topmost tower stands a great temple with a fine large couch in it” and it was more than likely the inspiration for the legendary “Tower of Babel” described in Genesis 11:1-9. After Babylon was conquered by the Achaemenid Persians in 539 BC, the era of ziggurat building came to an end. Despite controlling Mesopotamia for over 200 years, the Persians did not carry on the tradition of ziggurat building, although they left most of the extant ziggurats intact. Eventually, all of the ziggurats fell into disuse during the Seleucid Dynasty and the desert claimed most as casualties. Ziggurats enjoyed a long history and an important place in ancient Mesopotamian religion and culture. From their inception in southern Mesopotamia during the Uruk Period, until the collapse of the Neo-Babylonian Dynasty in the sixth century BC, ziggurats provided an important focal point for the religious activities of the various ethnic groups of Mesopotamia. Ziggurats were also vital in the early urbanization of Mesopotamia as communities formed around the important religious buildings. Perhaps just as important as the religious aspects, and possibly even more so, was the political legitimacy and gravitas a king or a dynasty could gain by building a ziggurat.